1990 - Opening of Seville Grove Library (then Westfield Library). 1990 - Governor's visit to Armadale. 1990 - City population reached 50,000. 1991 - Electrification of the Perth to Armadale railway. 1991 - Bushfire at Canning Dam. 1991 - The Schoenstatt Shrine replica is completed (Talus Drive, Armadale). 1992 - Work begins on the Araluen Country Club Golf Estate after much controversial opposition. 1992 - Premier Dr. Carmen Lawrence visited Armadale. 1992 - A Police helicopter crashed at Rushton Park during a public relations exercise with primary school students. Over 300 schoolchildren saw the helicopter descend and crash to the ground, watching as the four occupants were freed and the wreckage burst into flames. No children were hurt and all police officers survived, with no major injuries. 1992 - Work began on Stage 2 of the Minnawarra Park development, on the northern side of Armadale Road to create Sanctuary Lake. 1992 - Flooding damage to Urch Road Bridge. 1992 - Jull Street Mall created. 1992 - Arson damaged classrooms at Clifton Hills Primary School. 1993 - The first Armadale Highland Gathering took place. 1993 - Armadale Tourist Centre opens on Jull Street, featuring the relocated signal box from Armadale Railway Station. 1993 - Council places preservation orders on 20 notable trees. 1994 - Kim Fletcher's book Spanning The Years 1894 - 1994 was released, celebrating 100 years of Local Government in Armadale. 1994 - Roleystone Dieback Action Group formed. 1998 - Local community radio station Heritage FM began broadcasting on 97.3FM (this frequency now belongs to NOVA FM). 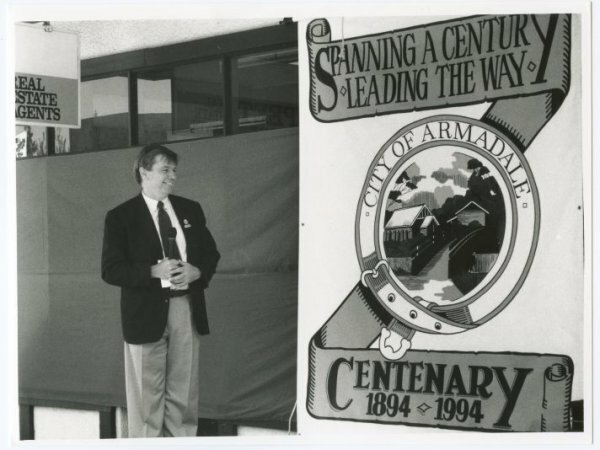 1999 - City of Armadale employed its first Environmental Officer, Ron Van Delft. Image courtesy of Comment News.